I don’t really have anything insightful to say about this, just that it’s an astonishing chart. 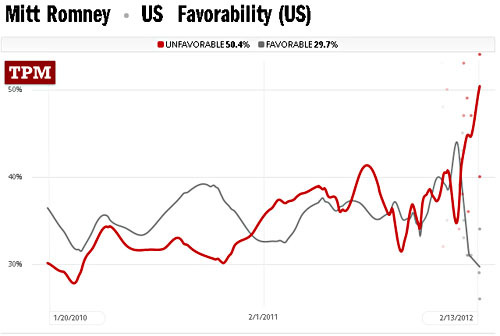 Mitt Romney’s favorability rating has been in complete free fall since early January. If the Republican primary lasts another few months, he’s going to be about as popular as your average dinnertime telemarketer. How Will Mitt Romney Spin These Jobs Numbers?